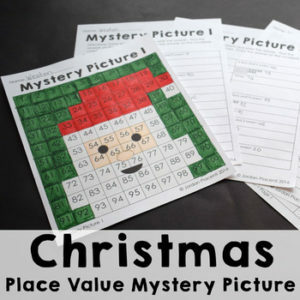 Practice place value with a fun Christmas themed puzzle. Students will practice place value by identifying numbers through base ten blocks, expanded form and tens and ones on their answer sheets. Then, they use their answers to color a 100s chart to reveal the mystery picture (santa). Each worksheet shows a two digit number in either expanded form, word form (i.e. 6 tens and 5 ones) or as picture of tens and ones blocks. After students solve the problem and write the correct number on their worksheet, they find the number on a blank 100s chart and color it a specified color. When they are done they will have revealed a fun mystery picture. This activity works great as a math center or a fast finisher. It can also be used as a whole group listening activity by having the teacher call out the number of tens and ones for each problem.